Happy Friday! We've made it through the work week and so far I'm enjoying my new position at a new firm. It's been quite a week full of new information, new colleagues, new schedule, and a whole lot of adjustment but I'm looking forward to settling in as time goes on. Thankfully, I have my boys to come home to. I've mentioned how Patrick will occasionally surprise us with his culinary skills and prepare dinner every now and then. But Joel is a budding sous chef himself. He absolutely loves to be in the kitchen, especially when it comes to baking so that he can watch the magic that happens in the oven through the oven window lol. 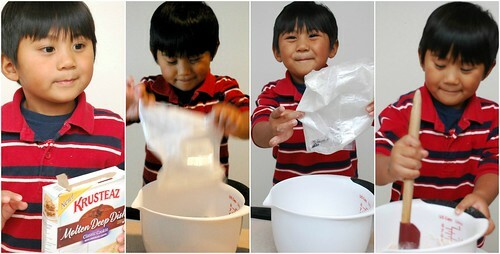 Because he enjoys it so much, I invited a few of his friends and their parents over for a Children's Fall Baking Party. It was a fantastic time to get the kids involved in the kitchen, learn about kitchen safety and baking basics, and of course, enjoy our sweet creations. 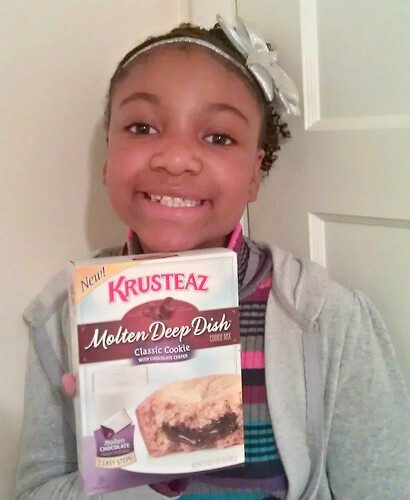 A special thanks goes to my friends at Krusteaz for partnering up with me to provide some easy to make baking mixes for our party! 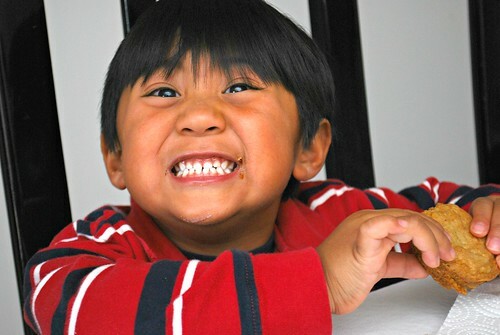 It got pretty chaotic (naturally) during our kitchen playdate but I have to give it up to Joel for being so photogenic while he demonstrated what all the kids would be doing. I think he has a good chance at following his mommy's footsteps and getting some tv time! 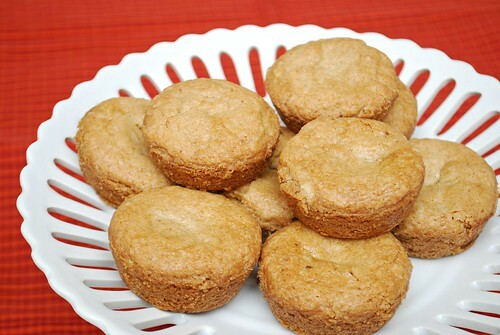 Joel and his friends prepared Molten Deep Dish Cookies. These were delicious and really fun for the kids to make. If Joel can make them, you certainly can too! Once we have a soft dough with all the ingredients fully combined, we divide the dough into 12 big balls. [This is where we got a bit messy and the moms had to help everyone out, so my apologizes for the lack of pictures.] Each ball of dough is divided in half and flattened out. We placed one flattened piece in each well of a standard muffin pan. 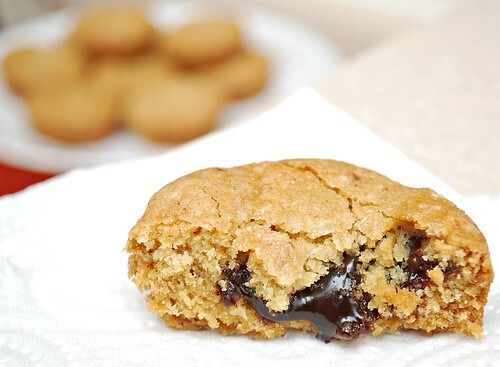 Then we took the chocolate filling packet included in the baking mix and placed a dollop of chocolate in the middle of each flattened cookie set in the muffin pan. Lastly, we placed the remaining flattened piece on top of each dollop of chocolate in the muffin pan. Then it was time to bake up for 18-20 minutes! 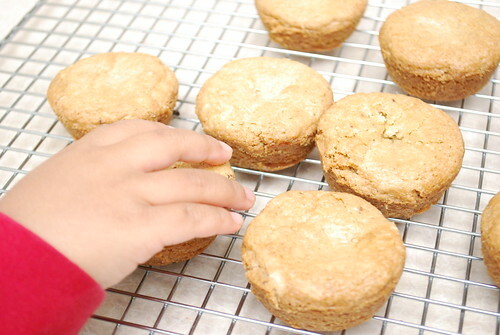 So here's to a sweet ending to the week and hope you check out Krusteaz to bake with for yourselves or with your kids. 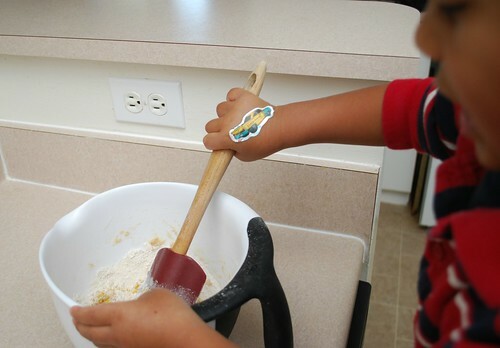 With a full and extensive product line, I'm pretty sure you'll find something delicious to bake up and Krusteaz makes it so easy by saving you time and making it fun! 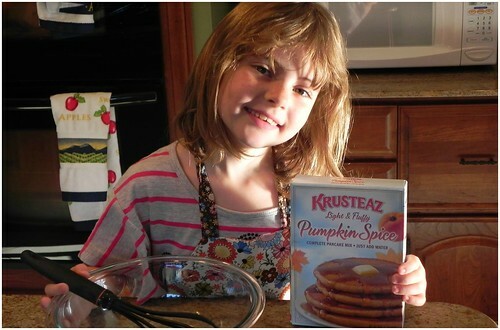 To learn more about Krusteaz check out their Website, Facebook Page, follow them on Twitter, and for some great recipes, view their Pinterest board! What a cute idea for a playdate!